BANGKOK — Advocates for Myanmar's Muslim ethnic Rohingya community said Wednesday that more than 100 members of the minority group have been killed in recent government counterinsurgency sweeps in the western state of Rakhine. Ko Ko Linn of the Arakan Rohingya National Organization said that according to villagers, at least 150 people had been killed in Maungdaw district by security forces since Saturday. Independent verification of both army and activists' claims is difficult because the government has restricted access to the area. "The reason why the international news agencies and aid groups are not allowed to go there is because the military is trying to cover up what they are doing there, the killings and other things," Ko Ko Linn said by phone. "They are lying." Nay San Lwin, a blogger based in Europe who has closely monitored Rohingya developments since 2012, said reports from a network of activists in Rakhine said that more than 100 bodies had been discovered by villagers, some covered by hay or burned. The government on Tuesday acknowledged the deaths of 69 "violent attackers" and 17 members of the security forces. The attackers weren't specifically identified, but the army has aligned with Rakhine Buddhists against the Rohingya. The government says the attackers burned down hundreds of homes, but rights groups blame the army for such actions and other abuses of Rohingya civilians. The two parties are also engaged in a propaganda battle. The government has said the international media are reporting "fabrications" about the situation, while Rohingya activists allege the army has taken pictures of captured Rohingya, including children, posed with various weapons such as spears and clubs. The government held a news conference late Wednesday in the capital, Naypyitaw, seeking to rebut critical news reports. President's office spokesman Zaw Htay accused the U.S.-based group Human Rights Watch of exaggeration in reporting Saturday that satellite imagery showed a total of 430 destroyed buildings in three villages, and said international media had misreported the situation. He said journalists were not yet allowed to go to Maungdaw for security reasons, and that the affiliations of the "attackers" were unknown. Tensions have been high in Rakhine since fighting in 2012 between Buddhists and Rohingya Muslims. 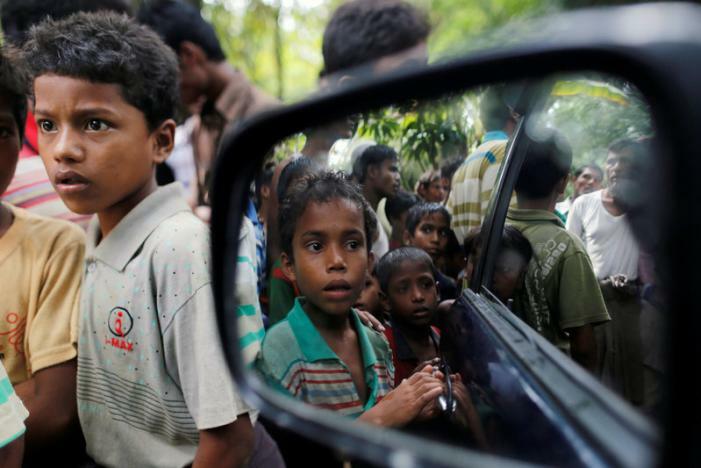 More than 100,000 Rohingya are still in squalid camps for the internally displaced after being driven from their homes at that time. Although many have lived in Myanmar for generations, they are widely regarded as having illegally migrated from Bangladesh, and the government denies citizenship to most. Government military operations intensified last month after nine police officers were killed in attacks on posts along the border with Bangladesh. International concern has been building since then. On Tuesday, the United States called for Myanmar to do more to stem the violence. State Department spokeswoman Elizabeth Trudeau said a U.S. delegation holding previously scheduled talks in Myanmar urged the government to "improve transparency." Concern was also expressed by former U.N. chief Kofi Annan, who heads a commission appointed by Myanmar leader Aung San Suu Kyi to investigate the cause of tensions in Rakhine. "As chair of the Rakhine Advisory Commission, I wish to express my deep concern over the recent violence in northern Rakhine state, which is plunging the state into renewed instability and creating new displacement," Annan said in a statement Tuesday. "All communities must renounce violence and I urge the security services to act in full compliance with the rule of law."